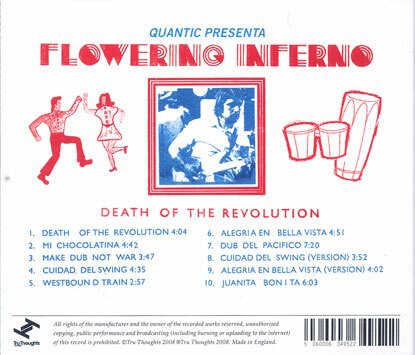 Quantic Presenta Flowering Inferno is the latest in the constantly evolving series of musical outings from the unstoppable Will Holland - aka Quantic - and amazingly 'Death Of The Revolution' represents his tenth full album release on Tru Thoughts. 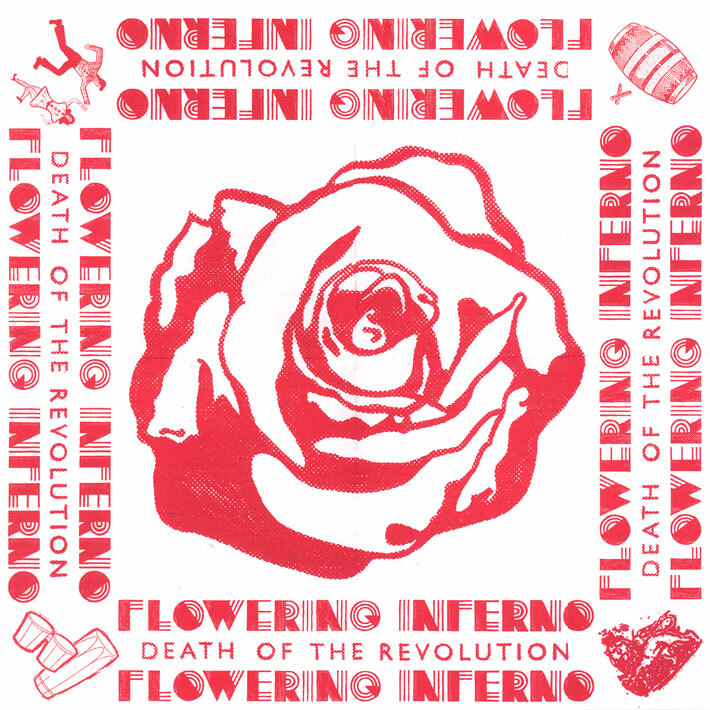 The concept and style of the flowering Inferno project rest simpy on pleasurable, easy-to-listen dub and reggae inspired music made in a tropical climate; and the standard and scope of the music is as dazzling as one has come to expect from this prolific, globe-trotting maestro. 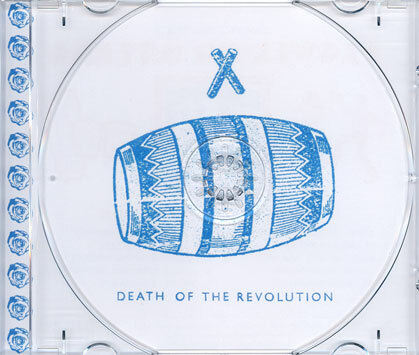 Unmistakably Quantic, but with emphasis on reggae inspired sounds, "Death Of The Revolution" is sizzling with summer heat and tropical influences. As on 'Tropidelico', Holland's last acclaimed album with The Quantic Soul Orchestra, the Columbian location in which this music was made and recorded has imbued it with an authentic and irresistible exotic air. All the tracks trip along on a reggae/dub vibe and are built on mainly hip hop oriented beats, with Holland in multi-instrumentalists mode, playing the piano, guitar, accordion and more - including Columbian instruments such as the Guacharaca, a small wooden scaper instrument, and the Gaita. Guest performances also come form a host of Latin American musicians. On "Juanita Bonita", the closing track, the evocative piano part is played by Peruvian Alfredo Linares who recently put in show-stomping performances when he appeared in the UK for the first time as part of The Quantic Soul ORchestra's tour iun March. 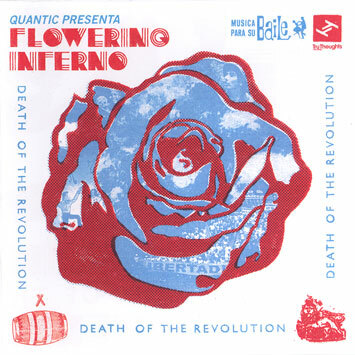 More a progression for Quantic than a change of direction, the inspiration to create the Flowering Inferno project came from listening to a lot of mid-70s dub albums and artists like Don Drummond and Bull Wackies; and also Columbian artists like Pedro Laza and Michi Sarmiento from the north coast. The basic ideas for the tracks were conceived and laid down over a three week period in the living-room of Holland's Columbia home, when his studio was in the process of being built. Over that time, using the piano and a small makeshift recording steup, the key ideas and hooks emerged and, as Will Holland says "when the studio was finally ready, the paint barely dry, it was given its maiden voyage on this material". the debut 7" single from this album is "Cuidad Del Swing" which opens with and undeniably cachy piano hook and whisks you off in its jaunty wake. 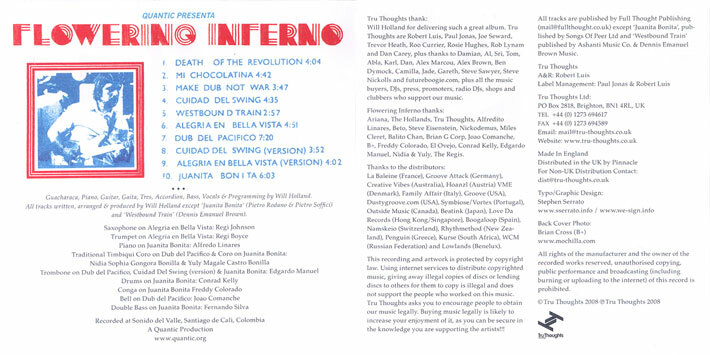 Also included on the album (as well as being the B side of the single) is "Cuidad Del Swing (version)", offering a different take on this track, with horns galore taking over where the original featured guitar and piano trills. 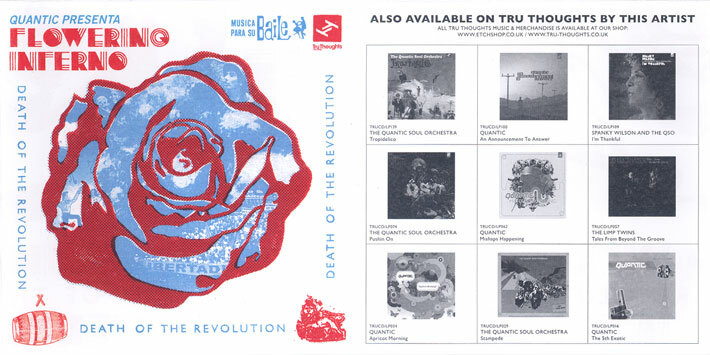 Predominantly instrumental, from start to finish 'Death Of The Revolution' is full of surprises, with a huge range of different instruments and vocal flourishes which add depth, such as the hazy breeze of backing vocals on the title-track. This is an album packed with infectious guitar and piano hooks, and with a laid-back but quirky feel, and ideall soundtrack to the summer. "Mi Chocolatina" and "Westbound Train" have a spine-tingling, cinematic quality. 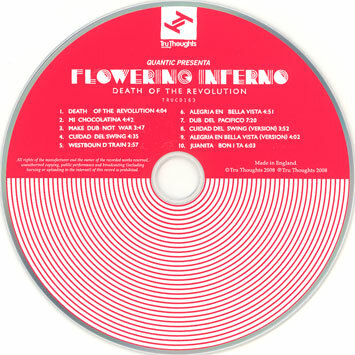 With record sales approaching 100.000, and a string of successes under his belt with a wide ranger of projects - from accomplished studio-based albums to the electrifying Quantic Soul Orchestra collaboration with the legendary singer Spanky Wilson - Quantic's Flowering Inferno is yet another exciting stage in his musical odyssey. simply brilliant. Holland's grooves are rivalled, in my opinion, by no other. as usual, there is just a constant avalanche of catchiness from his guitar, and his piano. what an artist. this LP would be the perfect soundtrack to any Latin America trip, and indeed any gathering this summer.